Growing potatoes is simple and offers a rewarding gardening experience for two reasons: 1. 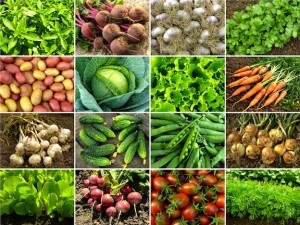 Planting a small amount can yield an abundance. 2. Harvesting them feels like finding a hidden, bountiful treasure. Read below and learn to grow your own potatoes in a small space. We’ve also included a favorite breakfast recipe that uses homegrown spuds. Potatoes are relatively easy to grow and can be grown in garbage bags, sacks, or potato bins. The potato bin is actually a large plastic 20 to 25 gallon bucket. This type of bin is large enough to accommodate other vegetable projects such as tomatoes, squash and cucumbers. Looking for the perfect bin? We have Gardman potato tubs in stock — these bags pop up and have access flaps on the side that allow you reach in and pull out potatoes when ready to harvest. To start potatoes in a bag or sack, roll the sides down until you have a planting area 8″ – 12″ deep. Site your project in a sunny location receiving a minimum of 6 hours sunshine. Poke holes in the bottom of the bag for drainage. Fill the bag with Sloat Organic Potting Soil. Mix in E.B. Stone Sure Start. Place seed potatoes 5″-6″ apart. If the potatoes are large, cut them in two. Make sure each piece has at least three eyes. Allow cut pieces to thoroughly dry before planting (about 3 days). 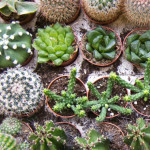 Cover the “seeds” with 4″ of potting soil and water. After the sprouts emerge, let them grow 4″ high and then bury the stems with E.B. Stone Planting Compost. Roll up the sides off the bag to hold everything in place. Continue to pile compost around the plant stems as they grow, leaving the leaves exposed. In a few weeks the bag will be unrolled to its full size. Leave enough space at the top for watering. You will need to poke some holes in the sides of the bag as well about 12″ up the side to improve drainage. The potato plant will form side roots (where the tubers form) all along its covered stem. To plant the bin, follow the same method as the bag. Drill a few ½” holes in the sides about 8″ up from the bottom to enhance drainage. Potatoes require regular watering but it is best to apply fertilizers lightly. Liquid fertilizer such as Tiger Bloom (2-4-4) can be applied every 6 weeks until June. 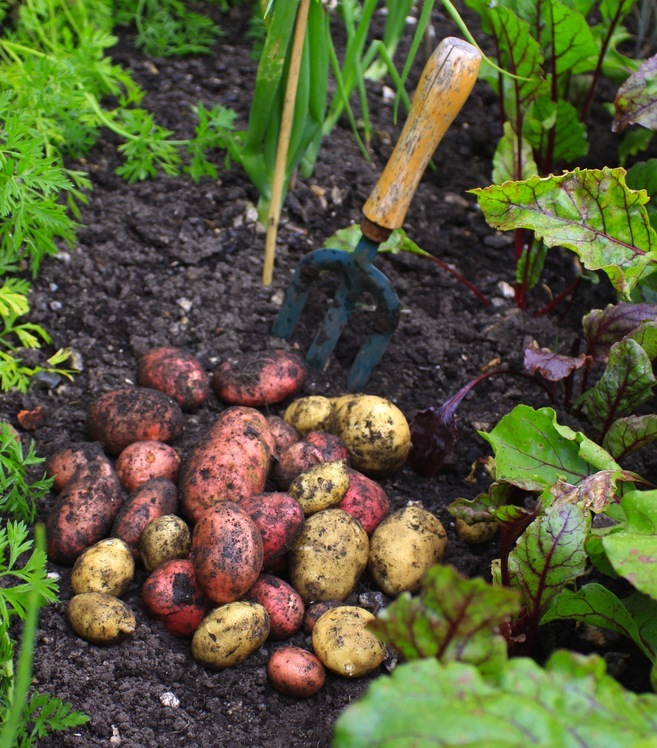 Give your potatoes a feeding of Grow Big (6-4-4) at the beginning of June and July. Feed nothing after the July feeding. Too much nitrogen enhances the top growth and we want the roots! New, small potatoes can be harvested anytime when the plant is in flower by reaching into the compost and wiggling them free. Mature potatoes are ready to harvest about 100 days after planting. The top of the plant stops flowering and begins to turn yellow. It has to be stated here because it HAS caused confusion- potatoes are formed underground, not where the flower is. Stop watering once the plant has withered completely. Harvest the potatoes by dumping the bag or tub in a part sun area. Allow the potatoes to “cure” (air dry) for 2 or 3 days before storing. Do not wash the potatoes as this will encourage rotting.